• Ensure that product does not come in contact with any non-recommended surface. It will etch polished marble, limestone and concrete, and may lighten the color of cementitious materials. • Do not use on acid-sensitive or polished surfaces. • Concrete and grout should be fully cured according to the manufacturer’s specifications. • Sweep or vacuum all surfaces to remove loose debris. • For best results, pre-wet the surface with water. 1. Avoid skin and eye contact by wearing chemical-resistant gloves and protective lenses. – Light-duty cleaning: Mix 10 parts water to 1 part cleaner. – Moderate-duty cleaning: Mix 5 parts water to 1 part cleaner. – Heavy-duty cleaning: Mix 2 parts water to 1 part cleaner. 4. Working in a small, manageable area of about 15 sq. ft. (1,39 m2), liberally apply an even coat over the required area with a paint brush, mop, sponge or paint pad. Do not apply with a sprayer. 5. Immediately remove product from unintended surfaces with a wet cloth to prevent potential damage to those surfaces. 6. Allow product to stand on the surface for 2 to 5 minutes. 7. 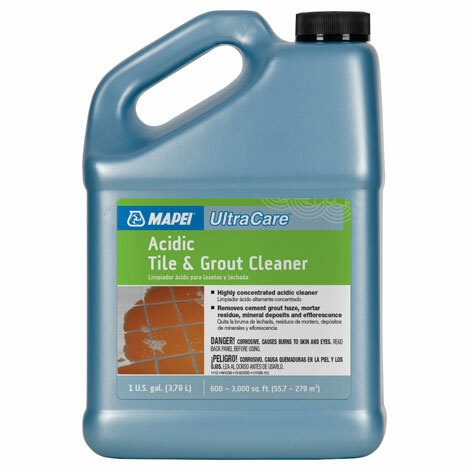 Do not let UltraCare Acidic Tile & Grout Cleaner dry on the surface. Keep the surface wet by adding more product. 8. Agitate surface with a soft brush or white scrub pad after first testing a small area to make sure that a brush or pad will not scratch the surface. 9. Thoroughly rinse the surface with clean water. Mop or wet-vacuum up the dirty solution and allow the surface to dry thoroughly.